If you haven't had a chance to check out my feature in Mode Models 2013 Spring Preview - I'm serving it up right here for your reading pleasure. 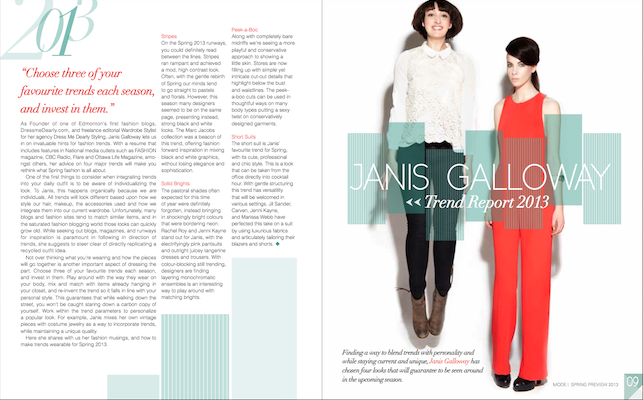 Inside I share my spring fashion trend report along with hair stylist Kirsten Klontz and makeup artist Nickol Walkemeyer. Also, Mode Edmonton unveils its top three models to watch this year - young ladies with huge promise and the right attitude. Rad photos by Aaron Pedersen. Big thanks to the team who worked on this shoot, I had such a blast!